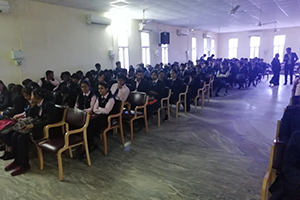 Rajasthan Institute of Engineering & Technology was graced by the presence of Shri Sumit Inani on 5.2.19. 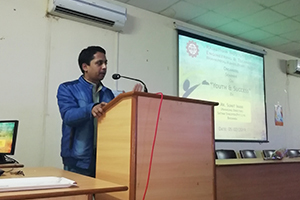 Shri Sumit Inani , who is the Managing Director, Satyam Syncotex Pvt Ltd, Bhilwara, and a Dediacted Volunteer of the renowned “Gayatri Parivar” gave a motivational discourse on ‘Positivity and Success’. 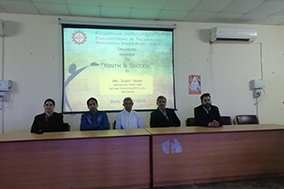 The occasion was enhanced by Dr. Saroj Hiranwal, Principal, RIET, Prof. Kapil Dev Sharma, Dean Academics & Admin, Dr. Sachin Sharma, Vice Principal RIET, along with all the respective HODs who participated in the event. 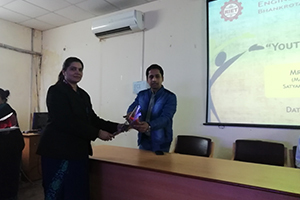 Dr. Saroj Hiranwal, Principal, RIET, welcomed the guest at the onset of the programme. 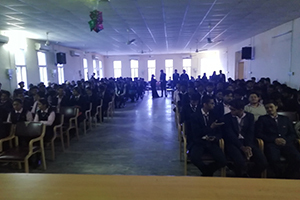 The students of first year B Tech and Second Year Btech were the participants in the speech which was mainly on ‘Positivity and Success’ in the life of a human being. Shri Inani also discussed about “future aspects and future goals” of budding the engineers who have just entered the boundary of a technical college. He spoke about ones aim in life and how to identify it. We need to enrich our personality because that is which makes us a complete human being. He also spoke about the karma of a human being, which one needs to keep clear. He gave real life examples of positivity in life and spoke at length about the preaching of Swami Vivekananda. 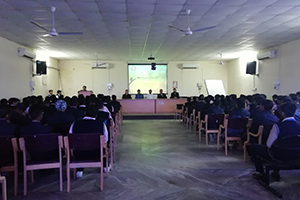 The session was appreciated by all the senior members of the college, the HODs as well as the students. The gathering ended with the note of thanks to the speaker and definitely the college looks forward to many such an occasions in future.